The American academic literature on Ukraine is a total disaster. A quick search on Google Scholar will show that there is almost no divergence from the official line of the major media, corporate NGOs or the Department of State. A search today reveals such titles as “President Yanukovych's Growing Authoritarianism,” “Toward Sultanism Yanukovych Style?” and two articles about the former President's net worth. This is on page one. Yet, if this is what is required, why then become a scholar? What is the point of being an echo? It is as if that since there are so few who can intelligently refute their recycled ideas, there is no real point in worrying about logic or facts. Viktor Yanukovych, who won the presidential election in February 2010, quickly consolidated all political power under the Party of Regions, completely marginalising the country’s opposition forces. After amending the constitution and restoring a presidential system of government in Ukraine, Yanukovych took control of Parliament and consequently became the country’s most powerful political figure since independence. Furthermore, both the president and his party enjoyed a relatively high level of public support (Matuszak and Sarna, 2013: 9). This blatantly reads like an editor had insisted it be slanted to look like Yanukovych banned the opposition. It is so awkwardly stated that it is clearly something the authors were conscious of doing as a matter of policy. They were parroting a slogan rather than writing as they normally would. The group publishing this states about itself that it “provides independent research” and is “financed entirely by the Polish state budget” and says this without irony. After 20 years of condemnations of Putin, Lukashenko or Assad having “state owned media,” this is now seen as enlightened. As is well known, Ukraine's independence was a total and complete disaster without precedent in history in peace or war. Ukraine went from a first world to a third world country in a few years. Only for a time under Kuchma and Viktor Yanukovych restored some general economic growth. Since the first “Orange Revolution” of 2004 and the second a decade later, the economy again was drained of much productive capital. Just in the second quarter of 2015 the gross domestic product of Ukraine fell by 14.7% or says the State Statistics Service of Ukraine. The fall in GDP in the 1st quarter of this year compared with the first quarter of 2014 was 17.2% and compared to Q4 2014 and taking into account the seasonal factors, it can be reduced to 6.5%. The Ministry of Economic Development and Trade has estimated the decline in GDP of Ukraine in the first half of 2015 of 16.3%. The Cabinet of Ministers is considering three scenarios for the development of Ukraine's economy in 2016, according to which the fall of the country's GDP is expected to reach 11.9% to 5.5%. According to the forecasts of the International Monetary Fund and the European Bank for Reconstruction and Development, Ukraine's GDP in 2015 will fall by 9%. The World Bank predicts a fall in GDP this year to 7.5% and this is quite generous. Yet, again, a US backed coup has led to total disaster. Like so many other victims of the present global regime, tremendous potential has been destroyed and thousands of lives ruined given human ignorance, illness and moral degeneration. Ukraine has more citizens with advanced degrees (per 1000 people) than any other country in the world. She has solid natural resources, excellent ports, and trading partners willing to buy her goods. Instead, a handful of bankers decided to strip the country for a quick profit in the name of “the free market” and “progress.” Her social system deliberately destroyed, her people impoverished and her religion and heritage mocked on the altar of Jewish oligarchy. Even this description is too complex for the reality of what has occurred. This paper will make some sense of both the domestic policies of President Yanukovych and connect these with his general views of political theory and the present dismal outlook for Ukraine. The President is not overly concerned with theory and is generally semi-principled. Considered goodhearted and personally upright, he is not exactly charismatic and and falls radically short of the radical social-nationalism of Lukashenko. He is uninspiring and a poor choice for President at a time where the very future existence of Ukraine is at stake. He is not amoral and nihilistic, however, as his opposition clearly is. Ukraine is typified by a very low level of trust among people, even those sharing the same interest. Political parties as an institution are trusted, according to a 2010 poll, by about 1-3% of the population. This is because they have no real platform and when elected, the platform is no longer relevant. According to the work of Nikolai Shulga, few Ukrainians take the EU or NATO seriously as an option for Ukraine, meaning that the western narrative of this revolt for westernization is false (Shulga, 184). According to his analysis, the formation of the present Ukrainian elite went through several stages. First, the period of coexistence of the dissidents and the old Soviet elites. Second, starting in 1995, was the creation of three centers of power: the economic oligarchy, the criminal gangs and the new state bureaucrats. The clan-system of oligarchy developed with both a regional and ethnic coloring. Third, roughly from 1999 to 2004, the merging of all three groups and the total “oligarchization” of Ukrainian life. The old dissident groups are gone. Fourth, the Orange Revolution institutionalized the rentier society and small business were absorbed into the Regime. Finally, the period of Yanukovych, one of stagnation: no new ideas, no new recruits into the political system. The state was mildly strengthened at the expense of some of the western and central oligarchical clans, but this was the only real change (Shulga, 170-175). Developing against this [liberal] background is the moral degradation of society. It has become widespread and permeates all social strata. Morals of connivance and few moral rules governing interpersonal relations is the most widespread problem. Abnormal, deviant behavior has become a daily norm for the huge masses of people. The unfortunate foundation for modern, Ukrainian society is that of a man without ideology or morality, an abstraction: “a man without attributes.” Over two decades, this has created total moral liquidation and rendered Ukraine a permanently sick society (Shulga, 444). Of course, his conclusion is obvious: no one believes in western liberalism and certainly no one seriously believes private property is “sacred,” as the oligarchs teach. The price of this enforced social transformation was too high: it created a deformed state and destroyed the economic potential of the nation. Social stratification and immorality have destroyed all forms of social protection and no one has hope for the future. Yanukovych, while far from perfect, was in the middle of a radical overhaul of Ukrainian economic life at the time of the coup. The first decree of Victor Yanukovych as president of Ukraine was the reduction of the working staff and maintenance costs of the Presidential Secretariat to about 20% less than under the Soros-backed Yushchenko. About two-thirds of all ministries of the federal government were disbanded. In 2010, Yanukovych signed a decree on the formation of the National Anti-Corruption Committee, chaired by Yanukovych himself. The same day, Yanukovych created a “Reform Committee” dedicated to economics. He also insisted (contrary to some of his detractors) that Ukrainian will remain the official language of the country. Yanukovych, not too long afterwards, issued a decree on the establishment of the Council of Regions as a consultative and advisory body to the President of Ukraine. It was to ensure the interaction of the central government and local authorities. In so doing, he drastically reduced the number of companies and enterprises controlled by the state. Only companies in sectors of great strategic value remained state-controlled. He streamlined the means by which foreign investment can arrive in Ukraine. This included the fairly drastic reduction in taxes. In addition, he decreed that all public acts are to be totally transparent and all available to the public. This led to mass condemnations from his opposition. This apparently, was “opposed to European democracy” to cite Julia Tymoshenko. The deregulation of energy, the reform of all administration, the elimination of all corruption in tax collection and the abolition of conscription were all on the docket when the coup broke out. The coup repealed this anti-corruption measure and radically increased taxation (Matuszak, 2013). Between 2006-2008, the economy grew on an average of 5% a year, with a high of over 10%. The same basic growth rate existed between 2010-2012. The economy bottomed out between 2009-2010 and of course, since the US backed coup in 2014, where 2015 is going to see a full 20% of the economy be destroyed, go abroad or be liquidated. Wages have plummeted (when runaway inflation is taken into account) while official unemployment statistics put the percentage at about 20%. The real figure is about 50% and thus far, that is also the inflation rate (Speech of President of Ukraine XIII Congress of the Party of Regions 2012 and the State Statistical Service for Ukraine, 2015). Ukrainian industry has declined by 23% since the coup. New construction by almost 40% with almost all domestic banks in bankruptcy. Exports are down 23% while imports down by 30%. By contrast, Yanukovych stated that the economy in 2011 grew by 5.2%, which was 30% faster than the global rate. For the first three quarters of 2011, investment increased by 21%. In his 2012 speech to the Rada, Yanukovych stressed that economic growth increased by 6%, with a 22% increase in fixed capital investment. Industry increased by 11% while 15% was the increase in engineering growth. Since the first Orange Revolution, Ukraine saw a full 25% decline in GDP. Leonid Kuchma, on the other hand, saw a full 10% GDP yearly growth rate by the time he left office in 2005. The move to the east has its very clear and quantitative rationale. In his 2013 Address to the nation, Yanukovych made it clear that the bulk of the increase in Ukrainian exports were almost exclusively eastern. China went from 8% of the total to almost 10% in a year. India saw its share go from 4% to 8% of the total. In Ukraine in 2012, GDP growth in the face of a global depression was about 3%, but consumption domestically increased by 10% (Yanukovych, 2013: sec 1.1.1). As to whether the opposition Yulia Tymoshenko Bloc “Our Ukraine” is in any way “opposition” – it is not – it is a faction struggling for power. All their interests are confined to providing for their business clans' control over property. Upon becoming President herself, Tymoshenko held to exactly the same policy [as her opponents]. It is due to her and her associates that Ukraine was dragged into the IMF and WTO more intimately, bringing the economy in our country the brink of collapse (Symenenko, 2012: 37). The point is that there is no relation between policy, presidential power and the economy. Any growth cannot be blamed necessarily on the policies of Yushchenko or Kuchma. On the other hand, to deliberately turn away from the east would depress the economy. Few who know Ukrainian politics believe that politicians have ideals, that they are anything more than spokesmen for capital and that they do not call the shots that really matter. Now, as soon as that insight is applied to the west, things might improve. The broader point was that under Yanukovych, there was some mild improvement. Today, there is continued liquidation. For many years this author has mocked the pretensions of the “European” faction of Ukrainian capital, as if there are any products Ukraine makes that Europe cannot make themselves. The EU cannot absorb present domestic production, let alone imports from Ukraine. The example of Bulgaria is not reassuring. Against all rules governing entry into the EU, the Bulgarians were brought into the club to keep them away from Russia. Nothing about their economy suggested they had passed any of the Union's stringent financial and economic standards. In fact, they failed all of them. Since that occurred, the population of Bulgaria fell form 9 million to 7. Official statistics show 30% unemployment with corruption ruling at all levels of society. No one denies this and it has grown radically since the EU restructured what's left of their capital. The same exists for Ukraine. A fourth world country has nothing to bring to the EU. It is an act of strategic importance to sever this important nation from Russia. She has nothing Europe wants and has a production foundation aimed at the east, not consumers in the west. It is absurd to even consider that, even after a decade of miraculous growth, Ukraine could ever meet the EU's standards for economics, finance or state regulation. An effective system of state governance must be based on three fundamental assumptions: First, national traditions and culture; the rule of law and, from that, the democratic practices that soon permeate society and form the basis of democratic legitimacy. Actually this is the Republican idea - “the nation focused on the common good” which can be made real with the gradual modernization of society. Second, along with the economic transformation, the necessary constitutional and legal, and in the broad context – democratic, modernization all must be based on the nation. This is the foundation upon which we can bring the legislative and regulatory framework of Ukraine into accord with European standards. This is classically conservative common sense. There is no liberal order without nationalism. In fact, there is no order without nationalism. However, for the EU, a nation that actually sees itself s such will not be welcome. Law does not come from “national tradition,” but from the needs of finance capital. As if to offend the arrogance of the EU even more, he defines national independence as “primarily a state's ability to freely choose their own development paths, to protect the interests of its citizens adequately and to meet the challenges of the modern changing world.” Anyone subscribing to this example of “extremism and xenophobia” has no place in the EU. That would include about 99% of the European population. The politicization of foreign trade and the Ukrainian-Russian economic relations in general threatens trade and cooperation ties, bilateral investments, ones that attack existing technology and production chains. In turn this will provoke rejection of the joint modernization of production plans to enter the high-tech and innovative markets of third countries. 5. China and Russia are growing by leaps and bounds. The EU cannot get out of its debt stagnation. The Cabinet and Parliament are increasingly saying that any possible changes in the ranks of the country's leaders should be negotiated with the US Embassy. In America, we have seen the parameters of political appointments beyond which we cannot go. We understand that those who have promised to privatize all assets the Americans want, those such as Finance Minster Natalia Yaresko, the Minister of Economy Aivaras Abromavicius, the Minister of AIC Alex Pavlenko and Transport Minister Andrew Pivovarsky do what they are told, and the Americans do not hide their happiness (cited from Vitrenko Bloc, 2015). Its difficult to comment further on this. Unfortunately, this author predicted precisely this after the first revolution of 2004. Many present government operatives are not Ukrainian citizens. Like Kosovo, “independence” was sold to the population while it is presently the ward of the EU and governed by bureaucrats appointed by Brussels. Attracting Chinese investment and technological opportunities in different sectors of Ukrainian economy is a priority for Ukrainian-Chinese cooperation. China has significant resources in this area and has an active investment policy in many regions of the world, and has expressed interest in Ukraine's economy. The qualitative change in political relations with China made it possible to reach agreements on a number of mutual projects jointly implemented by the Chinese and Ukrainian companies in Ukraine. According to preliminary estimates the cost of contracts concluded in 2010-2011 amount to over $5.6 billion (Yanukovych, 2012: 3.3). To western capital, this meant the addition of Ukraine to the Russia-Armenia-China-Burma-Syria axis of resistance. However, in his election platform for 2007, he sought to raise the minimum wage, open free trade with the EU and avoid NATO. It was not as if he opposed European trade, he just realized what all sober people do, that no one in Central or Western Europe cares about Ukrainian goods except as a meant to get at the Russian market. Ukraine actively advocates the revitalization and development of trade and economic cooperation within the CIS on the basis of sovereign partnership, equality and mutual benefit. One of the important priorities of cooperation with CIS countries Ukraine considers the energy sector, where joint coordinated action of States concerned should ensure sustainable and reliable energy supply CIS countries, creating the conditions for the formation and effective functional cooperation. This was more evidence that Yanukovych had to go. While most Americans could not possibly care less what direction Kiev orients its foreign trade, the American financial and energy elite seem to live and breathe this issue. The one thing that is utterly unmistakable is that whenever trade is oriented to the west, the industrial growth of Ukraine falls. Yanukovych stressed Ukraine's independence by stating in his address to the Rada that the backbone of the Customs Union, Kazakhstan and Russia, are not always “reliable partners.” Nothing more could be clearer than his overall goal to play one bloc off against the other. Forcing both to compete in order to give Kiev the best deal. That common sense approach is now a fond memory, since now Ukraine cannot play this game at all (cf sec 4.5). 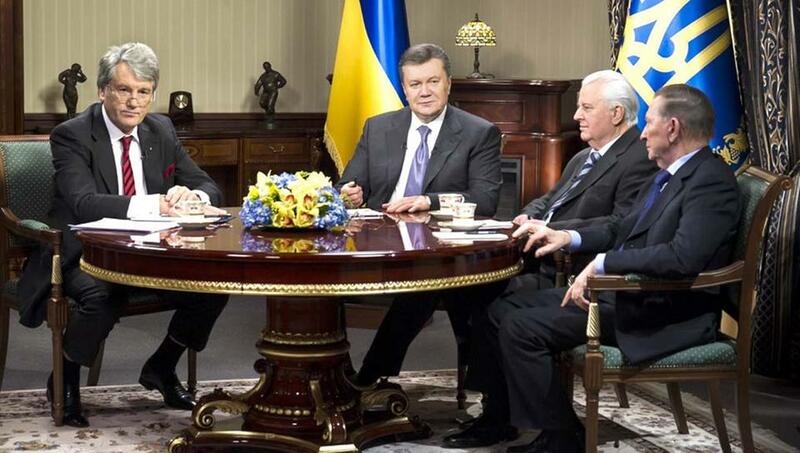 Yanukovych strongly rejected the notion that an alliance with one excluded the other. He saw both approaches as beneficial. Yet, this was too much independence for Washington. For the IMF and EU, one is either totally with them, or is their enemy (Vajra , 2009). Keep in mind that Yanukovych is no Lukashenko. He sought lucrative contracts with Shell and Chevron to tear up the country in shale-fracking techniques discussed below. Knowing the total disregard for natural resources a foreign firm will display in this regard, he collected the commission. In no way does this paper romanticize the President. However, it does argue that his general approach is the best chance Ukraine has to survive. This is a country that survived Polish and Jewish colonialism for centuries, invasions from Turks and Mongols, Soviet starvation policies resulting in the deaths of tens of millions, Gulags, dozens of genocide attempts, the German invasion and Cold War, but when liberalism is imposed on the country for roughly two decades, the country is on the verge of extinction. The protests of 2013 started when Tymoshenko, seen “internationally” as the face of a new, pro-western Ukraine, was convicted of numerous charges of what amounts to abuse of power. In general, the charge was that she acted “as the Ukrainian government” in signing gas deals that were quite unfavorable for the country. She was claiming to speak for the state when only speaking for herself. Since 1990, Tymoshenko has been followed by accusations of criminality. As a billionaire during the near-anarchy of the 1990s, there is good reason to believe her wealth was illegitimate. Several US auditing firms concluded that lots of money was missing from the energy budget while she was in change. The very fact that the coup repealed the laws by which she was convicted is substantial post facto proof of her guilt. Her former political ally, President Yushchenko, testified against her and few outside the west believe her innocent. Her party was polling far under 20% prior to the violence. She was no threat to Yanukovych. Her antics in the courtroom were staged: by being convicted of contempt, she was not cross examined. By forcing the judge to cite her for contempt, she conveniently avoided having to answer inconvenient questions. She believes she is the reincarnation of Evita Peron. She used fortune tellers to make important decisions. She used men to gain power including her husband Alexander Tymoshenko and her boyfriend Pavlo Lazarenko. While romantically involved, Lazarenko used his connections in the gas industry to help consolidate much of in into Julia's hands. He himself was convicted for racketeering by an American court. Finally, her next boyfriend, Viktor Yushchenko was cast aside once the “revolution” was finished in 2004. When the Orange Revolution broke out (financed by the US), she suddenly refused to speak Russian and began wearing traditional Ukrainian dress despite the fact that she's a mix of Jewish and Armenian. She is a total chameleon. She's played both sides of the Russia-Ukraine gas battles. She plays the “babe in the woods” routine when questioned. She has no political or ethnic loyalties and when Yushchenko turned on her, she went teary-eyed to Putin (Ioffe, 2007). Her recently quip to use nuclear weapons (that Ukraine no longer has) against Russians in the Donbass strongly suggests that she is merely a hypnotic, vaguely attractive instrument for the IMF to manipulate all players from Putin to Yushchenko. In essence, the Orange revolution in all its guises was a movement to enshrine and justify pure oligarchy. The cynicism has no vocabulary to describe it, it is really just the ability to program the re-definition of a term such as “democracy” to mean “the rule of the rich” without anyone noticing. Like it or not, that is the Enlightenment in a nutshell. The 2014 riots in Ukraine were about making sure that an oligarch never need to follow the laws that her servants and bodyguards do. More significantly, the global regime's press, without the slightest mainstream deviation, stated that Yanukovych earned the ire of “the people” by refusing to sign a union treaty with the European Union, in effect bringing Ukraine one step closer to full membership in the EU. There is one fact that this same press, with the same striking unanimity, could not describe: its cost. Why did Yanukovych reject the treaty? The press was permitted only unprovable speculations as to his inner mind. The truth was that, as this paper has already implied, that coming into these institutions requires a radical overhaul of the whole society. The violence had nothing to do with abstract issues such as the EU, but the President's refusal to sign it worth noting. In an excellent article by Zuesse (2015), he notes what no journalist noted at the time: the price tag on EU accession was roughly $160 billion. He had been told $9 billion in Brussels. He exclaimed “Can you imagine what would happen if our people were to learn of these numbers, were they to find out what convergence with the EU would cost our country?” This information was not secret, and since it was not reported anywhere, it was actively suppressed. He could not sign this ridiculous treaty because it would effectively cancel Ukraine as an independent state and bankrupt the already bankrupt society. By the end of 2013 before the violence became savage, the Ukrainian debt burden was beyond repayment and the country, to the extent it was governed domestically at all, had no real money coming in. With several billion offshore in Israel, Cyprus and New York, the elite racked up a debt to the International Monetary Fund of just under $1 billion. Given that confidence in the currency was non-existent, the costs of any international exchange at all was monstrous. Capital was liquidated by the oligarchs and sent to offshore accounts. Banks, local elites, mafia and oligarchs were difficult to differentiate. Jewish oligarchs liquidated the labor of millions in the 20th century and appropriated it. Then leveraged that to keep the “government” afloat, meaning they extracted more usury from the population they stole from in the first place. Most of the foreign currency bonds floated by the Ministry of Finance (in the amount of $500 million) were bought by unknown persons in mid-November 2013. The day Yanukovych refused to sign the EU agreement, these oligarchs bought about $300 million worth of debt and again on 28 November, the day of the Vilnius Summit, another $20 million. Another bunch was bought when the protests became violent (Katasonov, 2013). Ukraine was in de facto default since 1993 at least. This meant that buying debt automatically laid a claim on Ukraine as a country, her resources and capital. As time went on, even vital and “strategic” companies were put on the block. Yet, proceeds from these have not gone to the state nor foreign creditors. Now, there is no more blood to absorb, so running to the USA and EU promising to be an advance guard against Russia was the only choice available. 2. These movements have no goal except a change in government. A new ruling faction is installed in the place of the old. The rhetoric is certainly not public about this, but in the absence of any real galvanizing ideas, this is all that's left. 7. Colors and symbols are aimed at the subconscious. They are designed to bypass logical channels and appeal to the underlying sense of insecurity. One example of this is the universally reported “fact” that Yanukovych had “snipers” shoot protesters. This was reported without dissent or any hint that it was purely speculative. It is wildly irrational. There is no interest at all served by doing this except for the protest movement. It continued to galvanize this movement and was spread through it via western media. To think that this policy could do anything but backfire on a government is absurd. Snipers? In a crowd of tens of thousands? Yet again, no reason, logic or even common sense was applied to this mindless and idiotic media slogan. “Professors of Political Science” to this day pull down six-figure salaries with tenure repeat this discredited myth day after day. Facts are not important – being a part of the establishment is. Amanda Paul writes “Mr Yanukovych has pledged to strive for a balanced relationship with the West and Russia, although he is regularly still labeled a “Kremlin Stooge” - something he capitalized on during his election campaign.” Again, facts mean nothing and, given the fact that Ukraine remains very obscure, there are few to contradict them. When we read the speeches of “velvet” and “Orange revolution,” one can see that they are not built on rational concepts and categories, but rather images. These are ideological phantoms: they separate “people” from “cattle.” These are the symbols used without any definition such as the “Donetsk thieves” or “Russian special forces.” These permit the organizers maximum mobility and increase popular vulnerability to manipulation as a combination of two worlds that do not deal in firm concepts: the imagination and the senses. Emotions and images are linked: these are the main ingredients of the psychic world (Kara-Murza, 2005: ch 2). The purpose and meaning of Maidan to the people lay in its slogans. But these slogans had no relation to its actual meaning and purpose. All the talk about the “people's right to choose,” “democratic values,” “European choice” and so on, were a pure propaganda which stimulated the emission of the energy of the masses, increasing exponentially through synergy. The irony is that the “democratic” values are promoted without even the pretext of reason or debate, and Russian journalists were immediately put out of the country upon coming to power. They were rubbing the noses of their own supporters in their degradation. No criticism of “democratic values” was permitted in the American press at that time, and no dissent was permitted. Liberal, socialist, neo-conservative, communist, anarchist and everything else was in full agreement. That is strong prima facie proof that the Regime was knocking heads together. The very fact that the exact, precise same thing happened 10 years earlier (with the same results) shows the power of their psychological processing. Representatives of the US State Department in December 2004 reported that the Ukrainian opposition during the last two years has received about $65 million from Washington. The US Department of State admitted that, just in “public” money, Ukrainian liberals received $13.9 and $13.8 million between 2003 and 2004. This does not include officially-sanctioned corporate NGOs (Vajra , 2009). Admiral Yuri Ilyin is hereby empowered to take comprehensive measures to establish communication with all parts of Ukraine and all elements of the armed services in the interests of protecting the unconditional sovereignty, territorial integrity and protection of the legitimate Ukrainian government and its organs. He is temporarily assigned the position of chief of the General Staff of the Armed Forces of Ukraine. All unit commanders, units and ships within 24 hours are ordered to contact General Headquarters in Sevastopol. After that period is expired, all officers who have not complied will be deemed traitors and stripped of their rank without any further order. . . . Junior officers are empowered to take measures against their superiors who do not comply, including the use of deadly force (ibid). Yanukovych said the same for police units at all levels. Any foreign power not recognizing the Regime in Kiev then needed to present ambassadors to the Sevastopol naval base serving as the temporary capital of the country. This appeal went unheeded and the armed forces waited to see how events turned out. There is no reason to believe that western liberalism, almost universally blamed for the total deindustrialization of the country and the slow genocide of its people, had anything to do with these sudden, well organized and militarized protesters and their English-language protest signs. Ukraine's performance against the Republic of New Russia has been abysmal. Apart from a short-lived victory at the Donetsk airport, the Ukrainian army has suffered defeat after defeat. The reasons for this are not arcane: soldiers will not generally shoot their own people, and especially not for a government whose legitimacy is dubious at best. The army never swore allegiance to the coup. Technically, they remain connected to Yanukovych. As always, nothing makes sense about the western narrative about events in Ukraine. Since independence, academics and journalists have taken advantage of public ignorance and merely imposed their own vision on Ukrainian history and politics without regard to facts or history. To the extent that Ukraine is yet again being used as a springboard by western powers against Russia, western peoples should be alarmed since it may well be the first step in a new, global war that the west cannot win. Zuesse, E (2015) The $160 Billion Cost: Why Ukraine’s Viktor Yanukovych Spurned EU’s Offer, on 20 Nov. 2013. Center for Research on Globaliztion. RBC (October 25 2013) В.Янукович: Украина не должна выбирать между ЕС или евразийской интеграцией.